With a good software-driven product, the hardware is almost inconsequential. After the unboxing and the setup, it just sort of fades into the scenery. That was always the case with Amazon’s original Echo, but even as Alexa continues to do all of the hard work, the grandaddy of smart speakers was in dire need of an update. It’s been nearly two full years since the first Echo was made available to Amazon Prime subscribers. In that time, the company added six new members to the Echo family (seven if you count the Tap, which Amazon kind of, sort of does) — and in the case of the Echo Dot, did one full product refresh. Google entered the space in a big way with Home, and both Apple and Microsoft have their own takes arriving by year’s end. While it’s true that Amazon’s products have rarely been about the hardware itself, the original Echo was long overdue for a rethink, as devices like the Dot started blowing past it on the company’s Top Seller charts. Announced at an event at Amazon’s Seattle headquarters last month, the all-new Echo finds Amazon looking to remain competitive in the field it pioneered. The new Echo is more compact than the original. It’s also better looking, with six swappable shells designed to help it better blend in with its surroundings. The sound has been improved this time out, finally embracing the “speaker” part of the smart speaker category. Perhaps most importantly, however, it’s cheap. At $100, the new Echo is a full $80 cheaper than its predecessor — and $30 less than its closest competitor, Google Home. It’s Amazon doing what Amazon does best: undercutting the competition. Rumors started circulating about a new Echo a few months back. The line was long overdue for an update, the competition was intensifying and Amazon appeared to be working its way through the last of its Echo back stock. At the time, leaks positioned the product as a HomePod competitor, a high-end device with a new design and premium audio positioned to compete against Apple’s $349 Siri speaker. Of course, ultra-premium has never really been Amazon’s speed. The Echo’s populist approach has always been a big part of its appeal — a fact the Dot’s $50 price tag really drove home. Alexa users are primarily interested in finding an affordable way to make the smart assistant a part of their home, so the new Echo splits the difference on pricing, while delivering some additional hardware perks that help it stand apart from the best-selling Dot. It also splits the difference on sizing. The company has shaved about four inches off the original Echo, bringing it down to just a hair under six inches, with a footprint roughly the size of a pint glass (albeit without the tapered sides). It’s not nearly as compact as the Dot, but you’ve got to have a little height to thing if you want to get anything out of those on-board speakers. The top of the Echo has the same button layout as the second-gen Dot, including volume up and down and Action, which does a variety of different things, including waking the Echo, turning off times and enabling WiFi setup mode. And, perhaps, most importantly, there’s the Microphone Off button, which allows a little extra privacy. Tapping that will turn the LED ring around the perimeter a bright, unmistakable red. When listening for a command, the ring lights up blue, as always — though, the Echo is always listening, of course, lying in wait for its wake word. Conversations are sent to Amazon’s servers in encrypted form, “including a fraction of a second of audio before the wake word,” according to a statement the company offered up to us earlier this year. But a safe rule of thumb is, if you don’t want what you’re saying sent to the cloud, turn the microphone off. On the bottom is a small hole you push a finger through to remove the case, of which there are a half-dozen available at the moment, including three fabric colors (black, gray and off-white), two faux wood colors and a shiny silver cover. The swappable cases were a smart move for Amazon — the novelty of owning an Echo-style device has worn off slightly in recent years and many users likely want a product that mostly blends into the background. The unit Amazon sent along came with the heather gray fabric case, which, as one coworker quickly pointed out, looks as though it’s drawn some pretty direct inspiration from Google’s Home/Pixel design language. Whatever the case, the options here are definitely better for most homes than the RadioShack-style black plastic design of the original Echo. In the past year, sound quality has become a much bigger priority for smart speakers. There’s the HomePod, of course, and the Google Home Max — both of which are being positioned as speakers first, with a smart assistant built in. There’s also been a recent deluge of third-party manufacturers like Sonos, Sony and Harman building their own premium systems, featuring Alexa and Google Assistant. The new Echo is not that. The sound is definitely improved over the earlier model, but for the time being, the company seems to content to let those third parties do heavy lifting when it comes to building audio-first systems. That, after all, would mean a marked increase in sticker price, making the standard Echo prohibitively expensive for many users. The addition of the 2.5-inch woofer and 0.6-inch tweeter (same as on the new Echo Plus) means the Echo’s not bad for a $99 speaker. It gets reasonably loud — I had it on a max volume for a bit in the office, and it was distracting but not deafening (sorry coworkers). 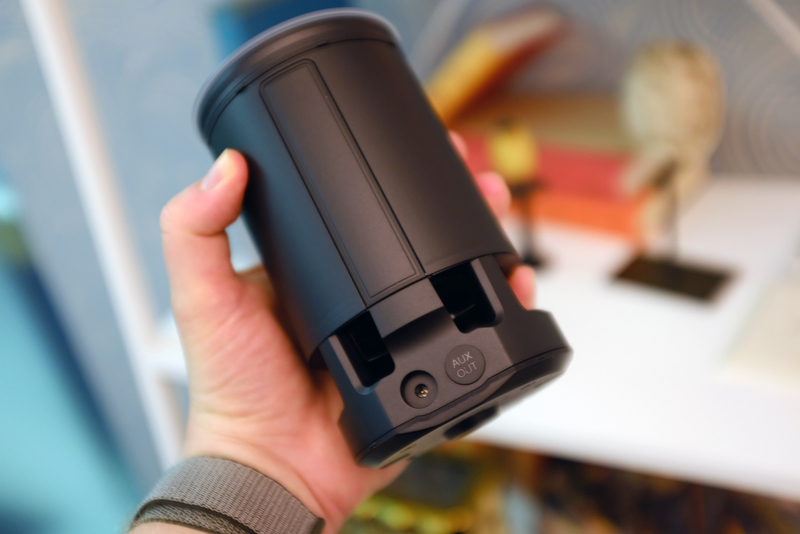 It’s about the quality you’d expect from a cheap, portable Bluetooth speaker. It’s good for listening to music or podcasts while washing the dishes or cleaning the apartment, but I wouldn’t want it to be my main home speaker. I’d take something like the similarly priced JBL Charge 3 for that purpose, any day of the week. 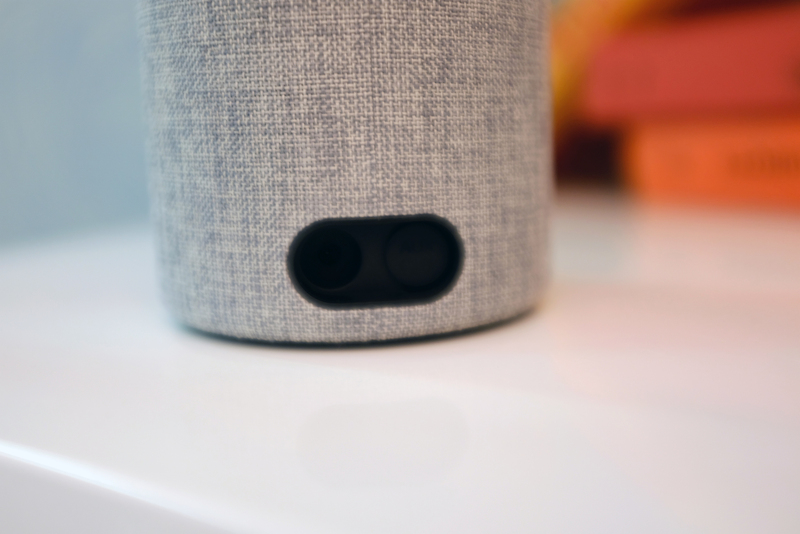 The good news on that front is that, in addition to multi-room audio through other Echos, the device can be paired to another Bluetooth speaker during setup and features an auxiliary out jack on the back. Amazon’s standard seven microphone array is back, as, of course, is its far-field tech, which allows different Echos to work in tandem, defaulting to the unit closest to the person speaking. Amazon’s got the microphone down. It was able to recognize my hushed tones from around 20 feet away. Though playing music loudly does impact its ability to hear well, cutting that range by about half in my testing. Amazon has had a steady march of new skills since releasing the first Echo back in 2014. Earlier this year, the company announced that it had topped the 25,000 mark. Of course, it’s a pretty broad spectrum, as far as usefulness is concerned. Some are pretty game changing for the line. Calling is a big one, letting the device ring other Echos or smartphones. 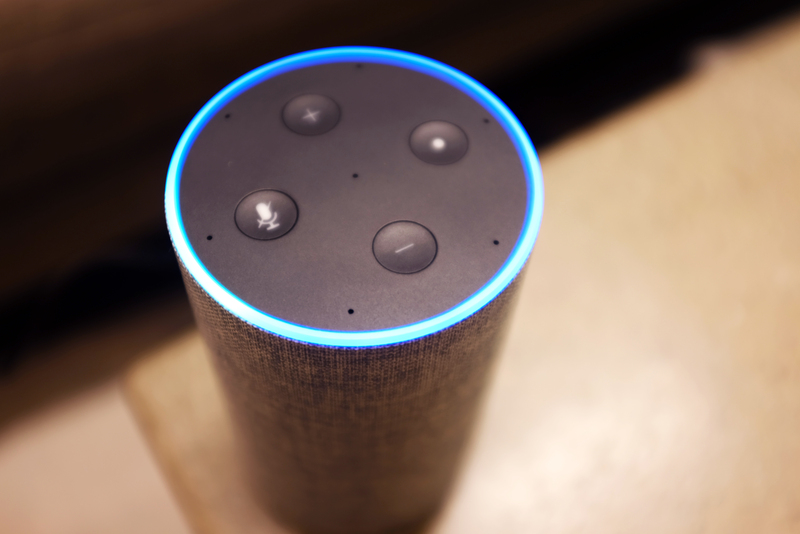 Ditto for voice recognition — Amazon was a bit late to the game on that, but the ability to distinguish speaking voices is a big deal for Echo homes with multiple residents. 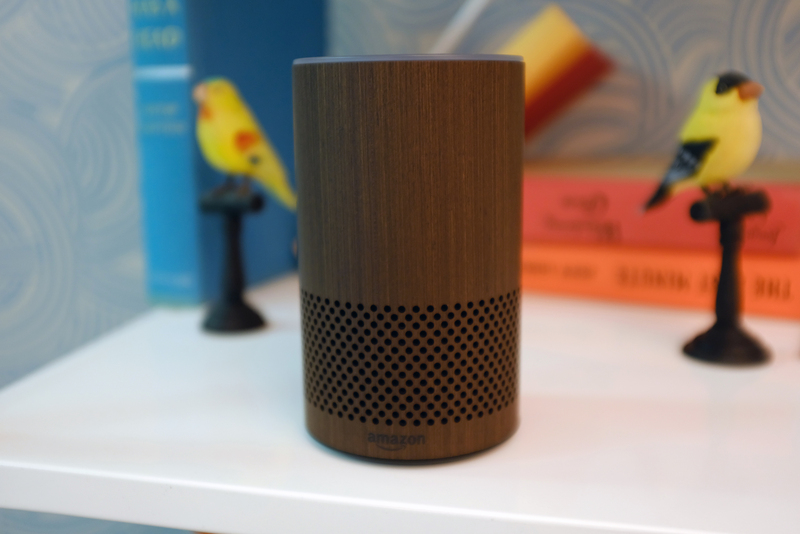 Alexa is about to get a big connected home overhaul, as well, bringing new controls to the app and the addition of Routines, which lets users customize multiple features into scenes like “morning” and “evening.” Neither were actually available at the time of testing, but both will be rolling out soon, as the company looks to become an increasingly important presence in the smart home category. In fact, that’s essentially the Echo Plus’ raison d’etre, which is basically the new Echo, only with easier smart home on-boarded (and an additional $50 price tag). Increased competition from Google, et al. has been a great driver for the line. The new Echo is pretty much exactly what it should be: it’s smaller, better looking and has improved audio, all while staying under $100. The space is only going to continue to heat up over the next several years, and Google is certainly giving Amazon a run for its money with an extremely capable system and far better mobile distribution. But the line is still synonymous with smart speakers, and Alexa gets more and more capable with each day. It’s not as affordable as the Echo Dot/Home Mini or as flashy as the HomePod/Home Max, but the new $99 Echo is going to sell like hotcakes this holiday season.